In a press conference Tuesday, President Donald Trump again changed his position on the weekend’s violent white nationalist march on Charlottesville, Virginia, defending his initial statement that there was plenty of fault to go around, both on the side of the white nationalists as well as their counter-protesters. 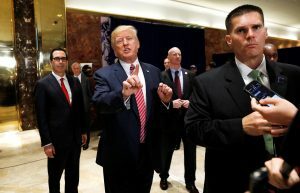 Since Trump’s statement, he’s been condemned on both sides of the aisle and his strategy council of CEOs has disbanded after a growing number of its members quit. Many have decried his remarks equating white nationalists with their counter protesters, and also pointed out the distinction between fighting racist views and espousing them. The moral argument aside, reporting shows that it’s simply not true that violence in Charlottesville was equal on both sides. But what does Trump mean when he uses the phrase “alt-left,” and from where did it originate? After the Charlottesville rally, the AP adjusted its guidelines, saying reporters should avoid using the term “alt-right” because white nationalist and other hate groups needed clearer definitions. As for the “alt-left,” researchers who study extremist groups say there is no such thing. Mark Pitcavage, an analyst at the Anti-Defamation League, told the New York Times that it “refers to no actual group or movement or network” and had been created as a term to make a false equivalence between the far right and left. Since “alt-left” had been used in a lot of different contexts, he said, AP would issue guidance that required reporters to explain it. According to the Washington Post, the term “alt-left” was first used on conspiracy theory-pushing websites like WorldNetDaily. As early as August 2016, that site published an op-ed entitled “Let’s look at the alt left” that argued that the Democratic party was as racist as the right, and that it should be considered extreme because it welcomed into its ranks communists and socialists. By December 2016, Fox News was also using the term “alt-left,” but in a different way, to argue that the mainstream left was out of step with the majority of Americans. As examples of the left’s radicalism, it cited that Democratic politicians had mourned the death of strongman Fidel Castro, and that the failures of Obamacare had been undercovered by the media. As of April of this year, conservative commentator Sean Hannity had begun using the phrase in a third way — and in the same manner that Trump did on Tuesday. Hannity used “alt-left” to describe campus protests by left-leaning students, and specifically the fact that they had turned violent. In Trump’s statements Tuesday, he characterized the “alt-left” as counter protesters who used violence, describing some who carried clubs. Leftist, anti-fascist activists known as Antifa, whose stated goals are to stamp out racism, white supremacy and authoritarianism, sometimes do use violence. The New York Times reports that scattered Antifa activists in Charlottesville used clubs and dyed liquids in their counter protests against white supremacists. But the NewsHour’s P.J. Tobia and Mark Scialla, who were on the ground in Charlottesville, report that there were very few Antifa present, and the vast majority of the counter protesters were peaceful. The worst violence of the day came when a car plowed through a crowd, killing a female counter protester. James Alex Fields Jr, who has been charged with second degree murder for the attack, is believed to have held white supremacist and neo-Nazi views. Violence from the extreme right far outpaces violence from the extreme left, according to an analysis from the Cato Institute, shared Wednesday by the New York Times. The analysis used data from the RAND Corporation and the University of Maryland’s Global Terrorism Database on the last 25 years of terrorism fatalities and injuries in the U.S.
Nationalists and right-wing terrorists were found to be the second deadliest group — after terrorism committed by Islamists — committing 219 murders in that time period, while left-wing terrorists killed 23. However, there has been a recent uptick in left-wing terror, with left wingers killing 13 since the beginning of 2016, and right wingers killing five in that time (Cato included the death in Charlottesville in that number). Despite that increase, nationalists and right-wing terrorists have killed 10 times as many people as left-wing terrorists since 1992, Cato found. Another study of radicalization from the University of Maryland, which tracked individuals from 1948 to 2013, found that far-right individuals, such as white nationalists and militia members, were more likely to commit violence against people, while far left individuals, such as communists, socialists or anarchists, were more likely to commit property damage. Where does the “alt-left” narrative comes from? Those who use the term “alt-left” consistently point to violence from the left, often by anti-fascists — both perceived and real. Anti-fascist activists rioted in multiple cities after Trump’s election, and, though Antifa was a tiny part of the counter protest in Charlottesville, it has been more active and aggressive in other parts of the country since Trump took office. NewsHour recently visited Portland, Oregon to look at how women who support Trump felt attacked by Antifa. Those who use the term “alt-left” consistently point to violence from the left, often by anti-fascists — both perceived and real. Though the majority of anti-fascist activity is not violent, the Atlantic argued in a piece Wednesday that conservatives successfully “use Antifa’s violence to justify — or at least distract from — the violence of white supremacists,” just as Trump did in his Tuesday press conference. Videos of Antifa violence, some of them doctored, are regularly shared on conservative, pro-Trump and conspiracy theory-pushing websites, often with commentary that suggests the media purposefully ignores those events. These videos often do not often include wider context or numbers. And on Fox News on Tuesday, commentator Tucker Carlson and a guest gave the “alt-left” a fourth definition entirely, suggesting that counter protesters who tore down confederate statues in the wake of Charlottesville were “iconoclastic” “mobs” who wanted to delegitimize the U.S. government. The segment made only fleeting reference to violence by the white nationalists who rallied there. Correction: An earlier version of this piece incorrectly stated that a University of Maryland study tracked far-left and far-right groups. The study tracked far-left and far-right individuals.